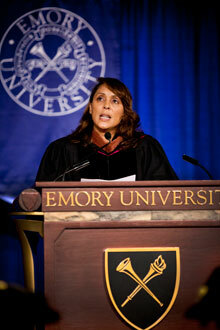 Natasha Trethewey, director of Emory’s Creative Writing Program and former U.S. poet laureate, collaborated on the Callaloo Conference and will offer comments on its opening night. Artists and academics from around the nation will gather at Emory 0ct. 15-18 for the 2014 Callaloo Conference, which explores the theme of "Making Art: Writing, Authorship and Critique" with an emphasis on equally valuing creative and critical works. The seventh annual national conference takes its name from Callaloo, "a journal of African Diaspora arts and letters," founded in 1976 by Charles H. Rowell, who remains its editor. Originally intended to be, as Rowell has written, "a Black South forum," the project grew to encompass the entire African Diaspora; now housed at Texas A&M University and published quarterly by Johns Hopkins University Press, it is recognized among the top literary journals in the country. Hosted this year at Emory by the Emory Creative Writing Program and Texas A&M University, the conference will feature four days of artistic and academic presentations and discussions. Most events are free and open to the public; you can view the full schedule, including times and locations, here. Natasha Trethewey, director of the Creative Writing Program and Robert W. Woodruff Professor of English and Creative Writing, will deliver comments to the conference on opening night; she served two terms as the 19th U.S. poet laureate. The Oct. 15 opening night event also includes a welcome by Emory Provost and Vice President for Academic Affairs Claire Sterk, comments from Rowell and a dramatic reading of "The Ballad of Emmett Till" by Ifa Bayeza, distinguished artist in residence and senior visiting lecturer at Brown University, followed by a moderated discussion with a diverse slate of respondents. The following three days feature a mix of speakers and respondents on key topics related to the African Diaspora, as well as literary and musical performances. Thursday, Oct. 16, begins with a morning session on "The Fine Arts & Africana Studies," followed by an afternoon session on "Archiving Africana" with keynote speaker Howard Dodson, director of Howard University's Moorland-Spingarn Research Center and university libraries. Thursday's schedule concludes with fiction readings by John Holman, Ravi Howard and Tayari Jones, with a moderated discussion. Friday's schedule includes speakers and panels on "Authorship in Africana Studies" and "Writing/Creating from the Archive," followed at 6 p.m. by Emory's annual Phillis Wheatley Reading, featuring Emory poets Kevin Young and Jericho Brown. Young is Atticus Haygood Professor of English and Creative Writing, as well as curator of literary collections and the Raymond Danowski Poetry Library for Emory's Manuscript, Archives and Rare Book Library; Brown serves as assistant professor of English/Creative Writing. The two will read in the Jones Room of Robert W. Woodruff Library with a reception and book-signing to follow. On Saturday, the day starts with a musical performance and award ceremony honoring cultural worker Samella Lewis. The afternoon features the conference's other keynote, a conversation with sculptor, poet and novelist Barbara Chase-Riboud, who recently archived her papers with Emory's MARBL. Titled "The Making of Art: The Woman who Began at the End," the conversation is introduced by Pellom McDaniels III, curator of African American Collections for MARBL. As the Callaloo conference schedule shows, a key goal is to privilege neither artistic creation nor academic critique, but recognize the value both bring to African Diaspora studies and to universities more generally. Explains Rowell in an editor's letter about this year's conference, "We want to acknowledge that what we write, invent, create — as literary and cultural criticism, as fiction or poetry or drama, as painting or performance art, as music composition or dance— should be equally valued, supported, appreciated, and respected by our colleagues and by the administrators whose watch maintains the values and boundaries imposed by the current organizational structures of contemporary universities." To that end, Rowell writes, the work of conference attendees at Emory should be read as "as an unmitigated statement intended especially for our colleagues in literary and cultural studies and for those in the multiple disciplines in Africana and related studies." "An end to the actions that divide creative and critical/academic voices; an effort to develop and establish means that perpetuate mutual respect; and mutual support for teaching and for the work, its production and publication"
"An end to behavior, actions, or words that devalue, denigrate, or privilege one discipline at the disadvantage or expense of another"
"An aggressive support of excellence in the production of writing and performance that is creative, critical, and archival." "It is our hope that our colleagues back home will observe and critique what we are doing here and set an agenda, in terms of their own college or university needs, that equitably supports and promotes their faculty members: what they do, how they do it, and why they do it," Rowell concludes. "That is, if English departments and Africana studies departments and programs take seriously our vision here, our institutions of higher education will broadly serve our nation and become stronger for having done so." The Callaloo Conference is presented with additional support from Emory's Department of African American Studies; the Department of Women's, Gender, and Sexuality Studies; the English Department; the Comparative Literature Department; the Fox Center for Humanistic Inquiry; the Laney Graduate School New Thinkers / New Leaders Fund; and Emory College.